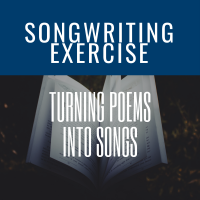 Turning poems into songs sounds like something that’s pretty easy to do. After all, the words are there. The rhyme is there. The meter is there. All you have to do is add the music! But the challenge is in creating something accessible to a listener that comes at them in a song’s structure. Ultimately, they shouldn’t be able to tell it was a poem. Try and choose a poem with a “form” rather than a free verse poem. Free verse usually lacks end rhyme, and there’s not a pattern to the meter, line count within a stanza (verse for you) or line lengths (syllable count for you), so make writing a song from them difficult. If you use a free verse poem, tip – look for internal rhymes you can leverage or vowel sounds. Lucinda Williams did a nice job of this with her father’s poem Compassion. Choose a poem that’s relatively short and leaves you room to create a chorus or refrain. Why? Because you don’t want a fifteen minutes song, and you want to leverage what makes a song a song, repetition to establish a “home base” for the listener. Can you find something that repeats that ties to the larger idea of the poem? Is there a natural “block” of four or five lines that would make a great chorus because it meets the criteria around a chorus’s role? Did you notice a key word or phrase that may not repeat, but is the heart of the poem? No Natural Refrain? Now What? Can you summarize this “chorus style”? Is the title of the poem in the poem? If not, will it work as a hook? Does the title make a better refrain if it’s long? Everything is sort of there already, but how do you arrange it, and what’s missing? Chunk out the stanzas as if they’re parts of a song. Label them as Verse 1, Verse 2, Chorus, Bridge, Pre-Chorus, etc. Try some alternative labels. E.g., no pre-chorus, label a line that way and is it something that could repeat every time prior to your chorus? Do the above on a few different print outs of the poem for use when you’re adding the music. They’re all structure ideas that create options for you later. Now take an inventory. What’s missing? Write out a few ideas for the missing pieces. You may have a whole chorus in mind, or a refrain or bridge idea. Write them all down. There will be a natural meter to the poem regardless of whether you’ve chosen a form or free verse. Read the poem out loud and tap your hand on a desk so you can hear the rhythm. Follow the nature cadence and rise and fall of the words within the poem to find your melody line. You may have a genre you naturally play within, but the poem may have one of it’s own. Explore that option first. Why? Because it will help expand your own song catalogue! Granted, mine was a bit easier since the rhythm was suggested by the title, but it makes the point: does your music work with the tenor of the poem? For example, William Mathews loved the blues. Using one of his poems would conjure up that particular genre. Is there a common chord structure for the genre you’ve chosen begin there with your chord selection. How do your chords fit with the natural melody line of the poem? Are you going “up” with a chord when the language is suggesting a darker moment or idea? Begin adjusting your accompaniment with the melody and you’ll end up with a unique progression. My Song From Theodore Roethke’s My Papa’s Waltz? In late 2018, my poetry mentor Arthur Smith passed away. He was not only an exceptional poet, but a professor generous in giving his time to aspiring poets to help them find answers and make discoveries about themselves through the world around them. While it was one of his favorites, for me it is a snapshot from my childhood and each time I hear it, I think of him and his gift to me.